Advantages Of Using Dome Cameras At Home | Calgary Alarm Inc.
With all of the security camera options on the market, it can be hard to decide which set-up is right for your home or business. Certain cameras are better at certain tasks than others, and they come in a wide range of functionality, as well as reliability, depending on what you are using them for. 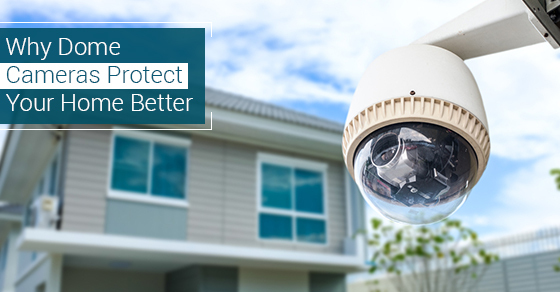 Dome cameras, so-called because they are dome-shaped, offer a wide range of security benefits that traditional security cameras do not. Below are some of the advantages of using dome cameras at home. People can see the camera. Dome cameras are widely used and, as such, are instantly recognizable. People see the smooth glass dome on a ceiling, or in a corner and immediately realize that the room is being covered by security surveillance. This is an excellent deterrent, as any potential intruders will know that there is no line of sight that they can avoid when trying to sneak or break into your home. Intruders cannot tell which direction the camera is facing. Most regular security cameras are either in a fixed position, or swivel in a highly predictable and observable manner. With dome cameras, the camera itself is covered by the opaque dome, so anyone looking at it cannot possibly tell which direction that camera inside is facing. The “smoked” glass, which gives the dome its opacity, will not interfere with the ability of the camera to do its job, or with the quality of the footage captured. Generally speaking, dome security cameras are fairly low cost and come in a wide range of styles and sizes to fit your needs and space requirements. They can also be armoured and vandal-proofed, meaning that any attempts to block or damage the camera to gain unsurveilled access to your home can be prevented. They come in infrared and with night-vision capabilities as well as a range of colours to fit the colour scheme in your home. Dome cameras are easy to attach and install and because they don’t have the armature of traditional “bullet cameras” they can be affixed to areas in your home which give you a better vantage point to observe from which encompasses a wider angle of the room. Dome cameras are affordable and can be tailored to suit your needs. Whether you are looking for something simply for the deterrence aspect, or want something that will be able to monitor activity in the dark and pick up heat signatures, there is a dome camera that is designed to meet your needs. If you are looking to install security cameras in your home and are having difficulty deciding on which to choose, consider the above benefits of a dome camera system.